“…It’s also clear we need a long-term plan to restore the unique beauty and bounty of this region. The oil spill represents just the latest blow to a place that’s already suffered multiple economic disasters and decades of environmental degradation that has led to disappearing wetlands and habitats. And the region still hasn’t recovered from Hurricanes Katrina and Rita. That’s why we must make a commitment to the Gulf Coast that goes beyond responding to the crisis of the moment. Develop a plan…every time I hear a leader of any sort, but especially a governor or a president talk about developing a plan, appointing a commission, developing a study, a shudder works through my system. Time and time again, we have been privy to some agency or group of people developing plans on how to fix a problem. While it is an understandable first step, typically the problem is nobody moves on to step two, or if they do, before that step can even set foot on solid ground, an axe arcs down and neatly slices the foot in half, rendering the plan that took forever to take shape meaningless. Today in the Times Picayune, America’s Wetland Foundation published an ad in cooperation with the National Wildlife Federation, Coalition to Restore Coastal Louisiana, Environmental Defense Fund, the Nature Conservancy, National Audubon Society and Ducks Unlimited, urging Ray Mabus to not just slap yet another band-aid on the Mississippi River Delta and actually do something meaningful to restore the coastal wetlands. Accelerating the payment of a greater share of federal revenue from Outer Continental Shelf oil and gas leases to Louisiana and other Gulf states. The existing revenue-sharing law would provide about $200 million a year to Louisiana in 2017. Arranging immediate financing for new freshwater and sediment diversion and barrier island reconstruction projects already authorized by Congress. 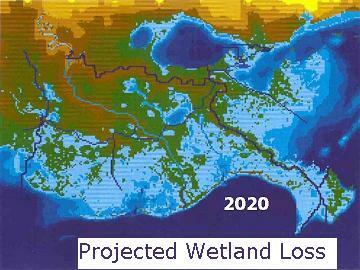 Establishing a dedicated long-term funding stream sufficient for Louisiana’s long-term coastal restoration plan. Cutting red tape to speed payment of existing federal appropriations for restoration projects, including more than $1 billion owed coastal states under the federal Coastal Impact Assistance Program. Creating a federal-state authority to oversee coastal restoration efforts that has the ability to act quickly enough to stave off further wetlands loss. It would seem time to finally do something about this problem, not just study it…and Mr. Mabus? Mr. Obama? Please keep Congress’s hands off this plan or any other you guys come up with, but if that’s impossible, aim really, really high with your coastal plan’s end result so when the axe does come down, you still have what you need to finally start restoring the wetlands instead of one more signing ceremony in the rose garden that accomplishes nothing. Just because Americans have grown used to empty words from politicians, doesn’t mean we like them. Previous Post Turns Out The Telegraph was Wrong…BP – Record Loss for 2nd Quarter…kind of. Next Post Update: The State of Mental Health in the Gulf Coast…Here Come the Numbers!